The 2017 hurricane system left a trail of destruction across the Caribbean. But less obvious than what last year’s most powerful storms did to natural landscapes is the effect they had on natural soundscapes. Results presented Friday at the Ocean Sciences meeting in Portland, Oregon, reveal how animals living on Puerto Rico’s southwest coast, including snapping shrimp, birds, and fish, changed their chatter during and after Hurricanes Irma and Maria, which blew through the Caribbean last September. 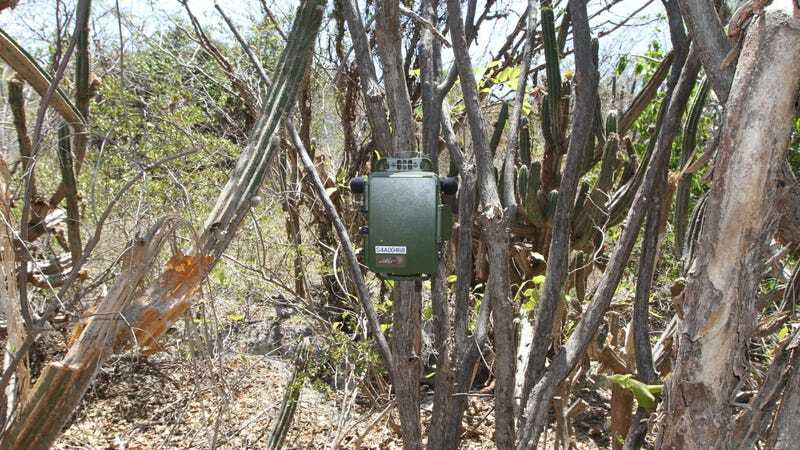 These observations, which were made with acoustic monitoring equipment placed in the field in March 2017, demonstrate the value of nature’s soundtrack for understanding ecological disturbance. “It was pretty stark,” Ben Gottesman, a PhD candidate at Purdue University who led the new research, told Earther, describing the shifts in the soundscape at the Guanica dry forest during and after Hurricane Maria. The changes, which persisted for weeks, included a drop-off in early morning bird calls, and in the hum of nighttime insects. Around the five second mark, the chatter intensifies as Irma passes the island to the north. According to the researchers, this could be due to fish increasing their nightly choruses in the days following the hurricane, possibly thanks to an uptick in water turbidity. “The interesting questions would be what [were] they like before and how quickly does it take for them to recover,” he continued. Researchers deploying an underwater microphone on Weinberg Reef. Photo: Rebecca Becicka, Alex Veglia, Jack Olson. That’s something the researchers are still working out. According to Gottesman, the fish choruses and shrimp snaps appear to have returned to normal, but so far, he’s only analyzed the forest data through November. And the researchers’ microphones are still out there recording the ecological cacophony. For Felix Martinez, an ecologist at the NOAA National Centers for Coastal Ocean Science who presented the findings last week, the work is part of a growing body of soundscape ecology research demonstrating how noise can be used to understand disturbances and assess ecosystem health. By building an acoustic baseline for different environments, scientists may eventually be able to travel to new places, take a sonic fingerprint, and say something about the health of that ecosystem. “This is just one more study building core knowledge,” he said.